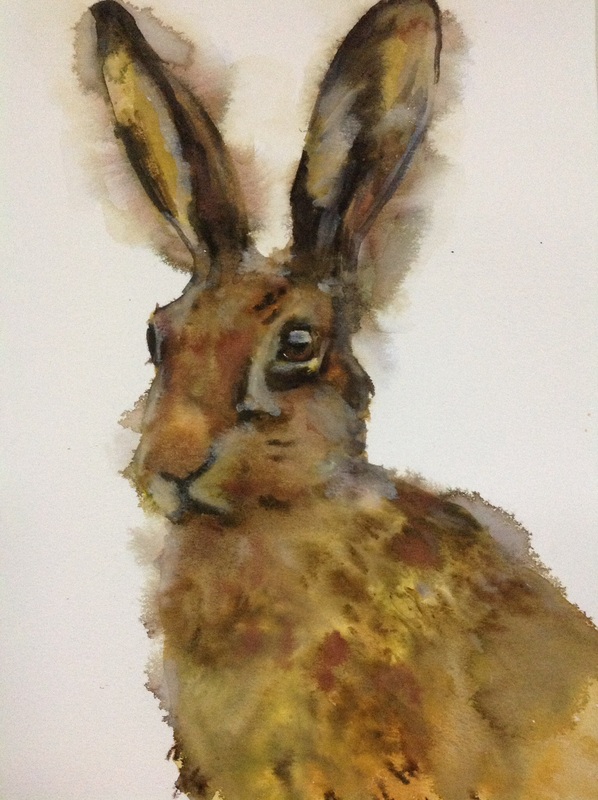 I had lots of fun with this, it really did not turn out the way I had originally planned, but I do like it, the way the hare seems to emerge from the paint. I used a lot of water, and even spritzed it more when it was near finishing which created some great paint dispersion, after it had dried( a little) I added some highlights, which also spread well. It is a little fun, a little different and a great play with paint. I love this! I haven’t even tried painting anything furry. You make it look so easy here! Did you see this technique in a video? Hi Laura, thank you for your comment, no I didn’t see this on a video, I am not sure it is even a valid technique, I was unhappy with some of my harsh lines, so went overboard with the water, which I think ended in an unusual happy end, I don’t even imagine that I could recreate if I tried, I might try to get a similar look with a donkey, as I think it could look quite cool. You should try some furries…. The more fur the better as it is very forgiving, certain breeds of dog, spaniel for example is a good one to try, and although they have quite a specific look, the fur hides some of the honey, facial structures which can be hard in other animals, such as the horse….. For every horse I get kind of right, I have many more that go wrong! Cute rabbit – I like the eyes on this creature as well. So important to get the expression right to get an emotional connection with the viewer one way or another. And this is so grand. I saw a rabbit in the grass on my morning walk today. Thank you, you are so right, if you get the eye right you are more than half way there, In fact I sometimes think you can create anything around a good eye? They are such lovely creatures, I enjoy painting them, they have a calming effect for me. LOL, yes – a good eye – good point!